Why does philosophy matter? It is a question I think about all the time. I know that some people think it doesn’t really matter that much, if at all. 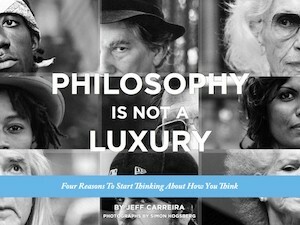 It might be because people think about philosophy in the way it is usually taught, as a long succession of treatises and books – an accumulation of ideas from the past that are difficult to understand and don’t seem to relate much to the life we are living. Philosophy may sometimes, and perhaps too often, be taught as words in old books, but philosophy itself is the deep contemplation of what it means to be human – at least that is what it means to me. Even the fact that it could mean anything at all ‘to be human’ is already amazing. Human beings are the one form of life on this planet that are concerned with the meaning of their existence. Dogs don’t worry about what it means to be a dog – neither do cats or mice or polar bears. One of the reasons that other creatures don’t worry about the meaning of life is that they don’t seem to have any choice about how to live it. Dogs just live the way dogs live. They respond to circumstances the way dogs generally do. Sure they may differ one to the other, but generally speaking they act more or less predictably like dogs. You may say that doesn’t sound that different than human beings. After all most human beings act more or less predictably like human beings don’t they? And, of course, this is true, but every once in a while something amazing happens – a human being stands out. They don’t live an ordinary life. They live an extraordinary life that is remarkably new and different from the norm. And sometimes these rare human beings discover a way of being that eventually becomes the new norm. Martin Heidegger recognized that most of us live as ‘the one.’ In other words we do generally what ‘one’ does and are concerned with what ‘one’ tends to be concerned with. In short we live a generic human life. He also realized that there was another possibility – a possibility to live a profoundly authentic and original human life. Unlike the rest of the animal kingdom, a human being could, if they were heroic enough, choose to live a different kind of human life. Ralph Waldo Emerson called such human beings ‘representative’ because their lives represented new possibilities for being human. What they have done is thought deeply for themselves about what it is that makes human life worth living. And they have come to their own conclusions about what is most profound and meaningful about human life and these conclusions guide their choices and fuel their excellence. Don’t take my word for it. Find out for yourself. Find a truly extraordinary person – someone who charted truly new territory in some field of human endeavor. Not someone of ordinary greatness, but someone of true novelty. Read about them, learn about them, and see if you don’t find that they were a philosopher. Their excellence was a manifestation of the profound conclusions that they had come to about what gives life meaning. If you want to live an exceptional life, not just one that is more or less predictably human, then philosophy is not a luxury – because only when we find true meaning in life will we be in a position to become an example of true creative excellence.